Our test targets are made with high-precision e-beam lithography. A 10×10 mm² quartz substrate with broad spectral transmission (DUV-VIS-NIR), on which a chromium layer of high optical density is applied, serves as a support. The test structures are produced by ablation of the chromium layer, whereby structural sizes down to 100 nm are possible. At the same time, excellent dimensional tolerances and straightness of the structural edges is ensured. The test targets are embedded in a support of the standard size 75×25 mm² for microscope slides. The structures are implemented as negative, i.e. the structures on the test are transparent, the background is blocked by a chrome layer. With this resolution testchart, the resolution limit of an objective can be determined very easily and quickly in transmitted light. 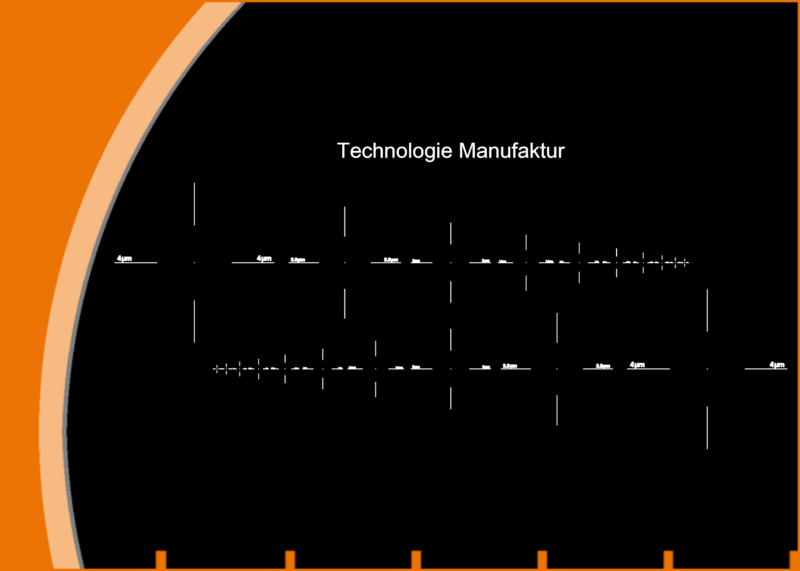 There are 59 line patterns with 7.5 to 3300 line pairs per mm in horizontal and vertical alignment. The simple arrangement of the structures and direct reading of the structure size on the test ensures intuitive handling. In addition, there are 5 pinholes with diameters between 4.0 μm and 0.25 μm to allow a more detailed characterization of micro-imaging optics. 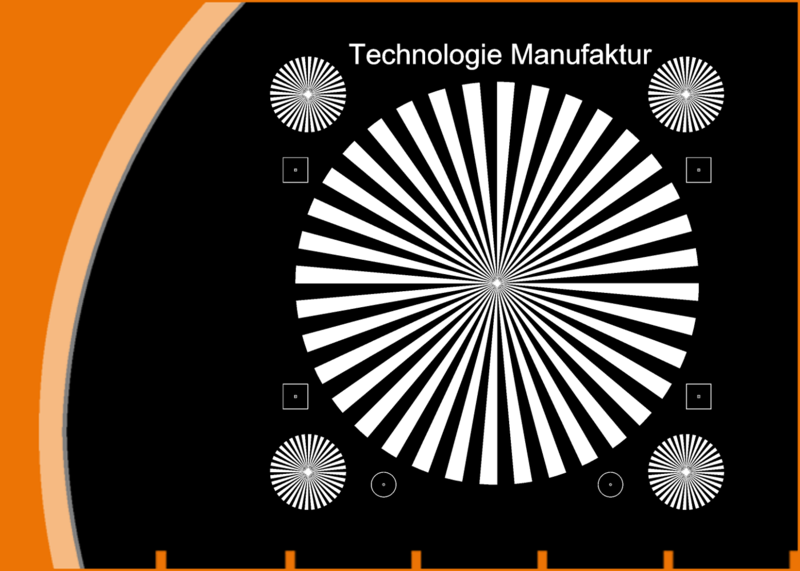 This resolution test consists of 5 Siemens stars and shows the peculiarity that the tapered segments in the center of the stars are precisely manufactured to a minimum width of 150 nm. Thus, this testchart is also suitable for the determination of the resolution of microscope objectives of very high numerical aperture. Additional measuring and positioning marks facilitate the adjustment. The pattern is “negative”, i.e. the Siemens stars are transparent. 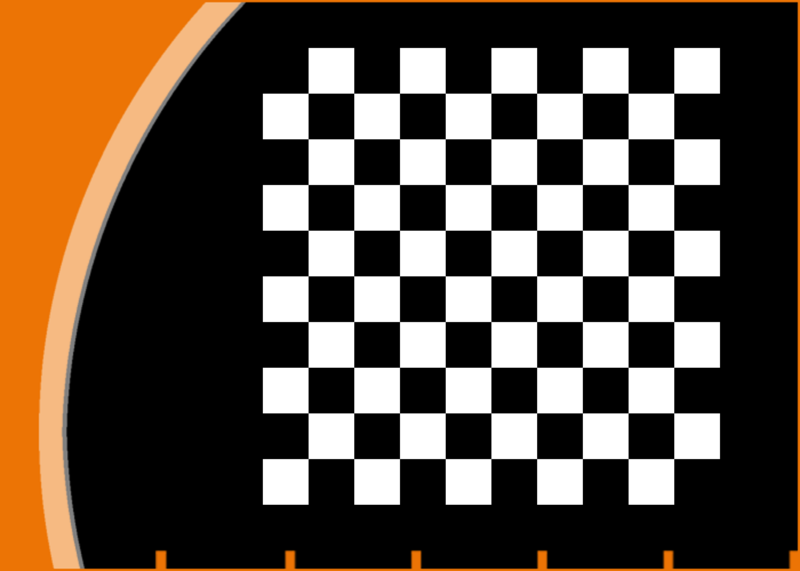 A checkerboard with a total size of 9.0 x 9.0 mm² out of 50 x 50 µm² squares. It is particularly suitable for testing of image skew and curvature. The edges are extremely straight and sharp and therefore allow determination of local image quality as well. This checkerboard pattern has square fields of the size 100 x 100 μm² and is more suitable for lenses with weaker magnification than TC-CB50. 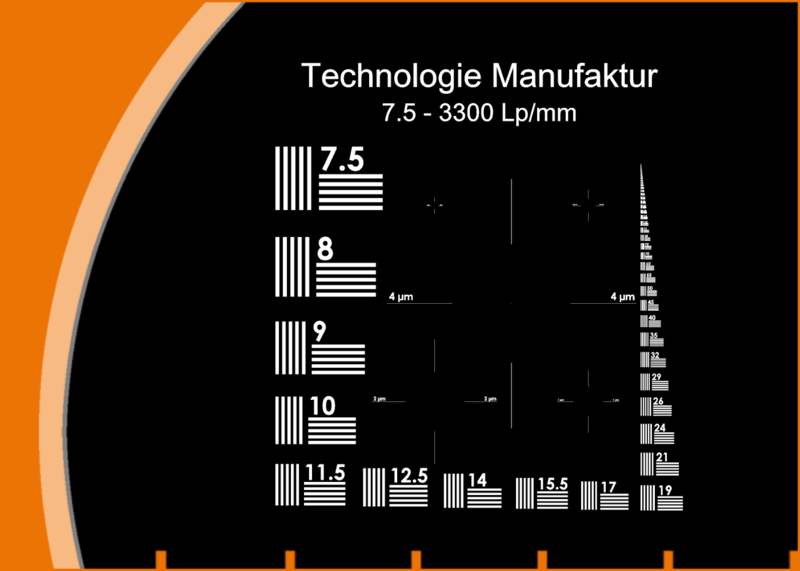 Pinholes of 0.18 μm to 4 μm diameter are provided on this testchart. The identically stepped pinholes are arranged in two rows in the reverse order. The pinholes are provided with sufficient dark area to darken the entire field of view of the lens to be tested. These pinholes are suitable for star testing of microscopic lenses and for general optical development tasks.